Emei Shan (a.k.a. Emeishan, Mt. O-mei or Mt. 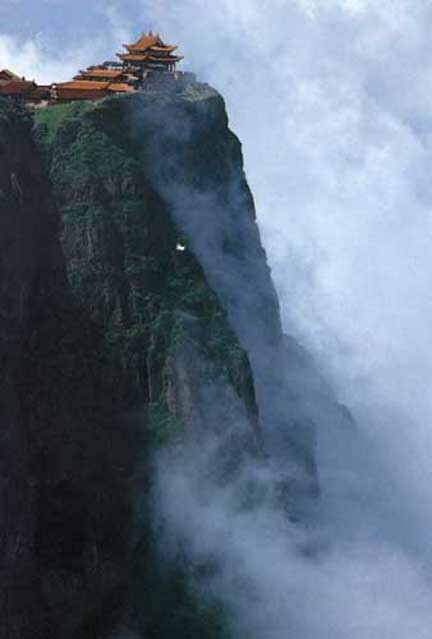 Emei), in Sichuan province, is one of the four Buddhist sacred mountains of China. At 3,099m, Mt. Emei is more than 1,000m higher than the other three Buddhist sacred mountains. Mt. Emei has been designated a World Heritage Site thanks to its breathtaking scenery, mysterious natural wonders, and historical Buddhist sites. The full day's hike to the summit is an unforgettable experience undertaken by many, but minibuses and cable cars make faster alternatives for travelers short on time. Leshan, a stream of visitors walk along a path to view the world's largest statue of the Grand Buddha, 71 meters high. The Grand Buddha, carved into the face of a cliff overlooking the Dadu and Min rivers. Our group in June 2004 with trip leader, Rebecca Kali and co-trip leader, Frances Gander were guests of the Emei Wushu Association. A sleepy rickshaw driver near Leshan. Yin Yang fountain in the garden of the Grand Buddha in Leshan.